We’ve got a few bird feeders hanging in our backyard. We have a couple on hooks near our deck, and we have an acrylic one outside our kitchen window. We enjoy watching the robins and cardinals and blue jays flying to and fro. We love when the robins build nests in our trees. It’s always exciting to watch the entire life cycle from egg to hatchlings to leaving the nest. Typically, the robins build in my neighbor’s tree, but this year they built one in our tree, too! Emma was so excited! Several years ago, Emma and I did a unit study all about birds. If you, too, would like to do a fun bird-themed unit study, you’ll love these resources and the HUGE printable pack I’ve created. Let kids make a nest. Here’s another variation of a handmade bird’s nest. Here’s a hands-on activity that demonstrates how a bird’s beak is adapted for the food it eats. Make bird feeder treats to attract birds to your own backyard. Learn basic woodworking skills while building a simple birdhouse. Learn about the parts of a bird with these printable bird puzzles. One of my daughter’s favorite activities is to dissect owl pellets! 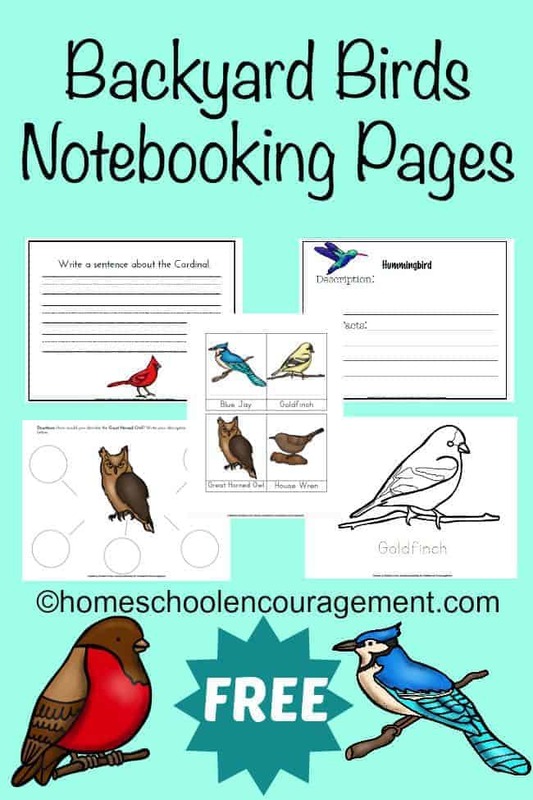 Download your FREE Backyard Birds Notebooking Pages today. Thank you for sharing your bird activities.